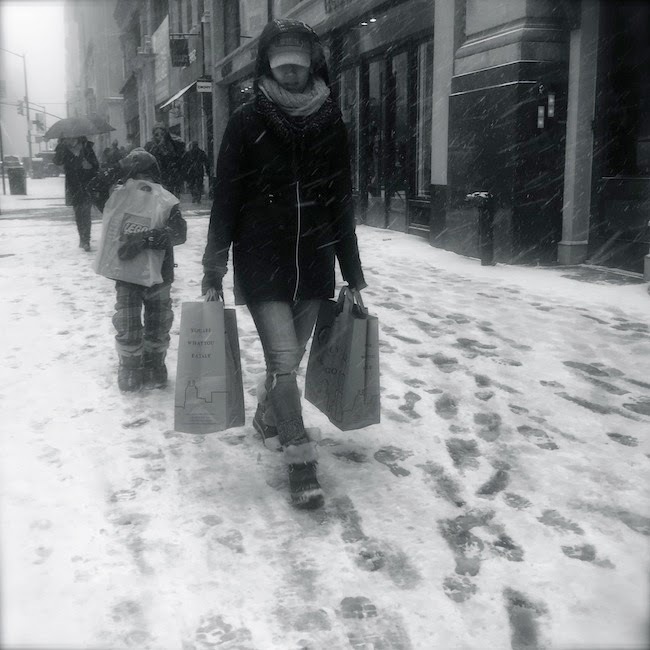 Have you been following the SNOWPOCALYPSE thats hit the North East? A.K.A. 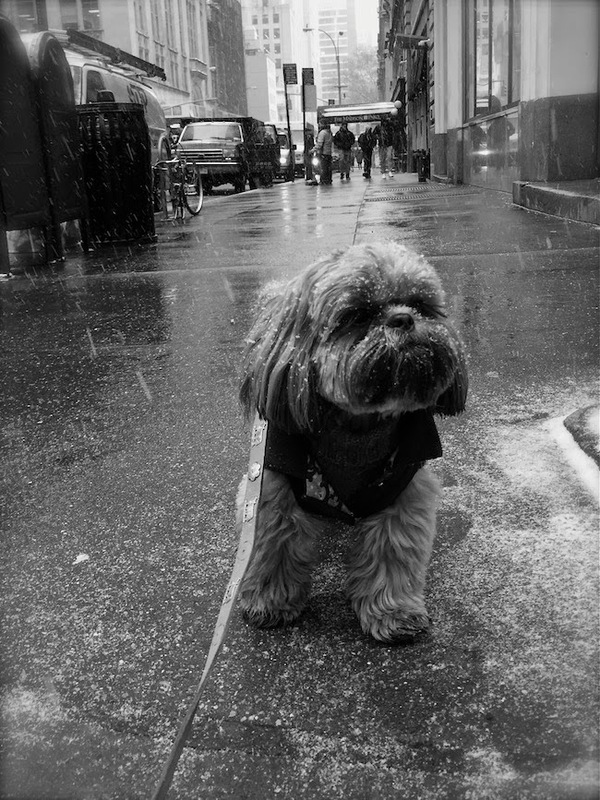 winter storm Juno. Well she's been showing us who's the boss for the last 24 hours! It has been snowing bucket fulls here in NY. About 2 - 4 inches of snow falling per hour. Thats rapid speed guys! We usually only receive 2 - 4 inches of snow in a days worth not in an HOUR. This girl is FIERCE! Total white out conditions because not only is there big snow flakes falling, but we have also been experiencing high winds. No wonder were in a state of emergency, and they're considering this a possible record breaking blizzard in history! When I heard the words RECORD BREAKING and had Con Edison our electric company calling me to sign up for automated text messages to report and keep up with the power outages in our area, I immediately took that as a sign that this blizzard wasn't going to be wimpy! After Hurricane Sandy in 2012 everyone does take warnings more seriously now and naturally have become hyper-sensitive. You saw what that Hurricane did to us and how it crippled us for weeks right? Our house didn't have power for 10 days, and we ended up evacuating to Texas because we were disabled for so long. This time I wanted to jet off to MIAMI, but I couldn't get everyone organized fast enough to catch a flight out before airports closed! So we instead followed our usual game plan - move to the city. My safety net. Yes I'm a city BRAT! 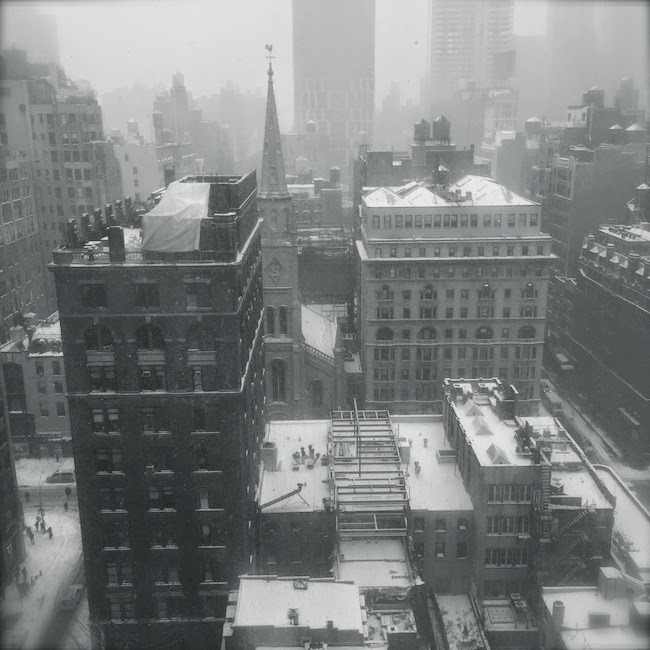 We bailed and skipped town yesterday at lunch time to head into the city, before the snow started to really fall hard. Rode out the storm last night safe and sound in a room with a view! SWEET. We brought a suitcase of food with us from home! HA. As double precaution also went yesterday to Eataly to buy more snacks. Like we really need it? PARANOID! Eataly was surprisingly a ghost town as were the city streets. LOVED it though. Normally your elbow to elbow and fighting for space. Also no queue to buy the best Prime Rib sandwich ever. Thats the first! HEAVEN. 2nd stop the Lego store. Each kid got a big lego set. Best ENTERTAINMENT for a snow day, and for saving Mama's sanity! Mega important survival skill. HA. 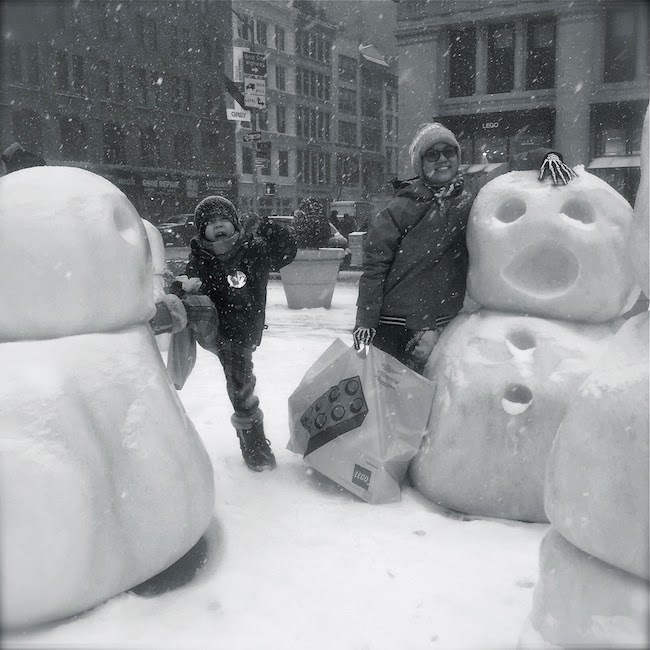 Then we discovered a new installation by Peter Regli of 12 Snowmen in the plaza outside the Flatiron building. From far they look like real snowmen. Very surreal in the snow. But they're life-size snowmen sculptures made from marble. Very cool, huh? I wouldn't mind having one for my backyard! Walked back through the park, with a mini snow ball fight to burn out the last of my two monkeys energy before the long lock up. I heart NYC. 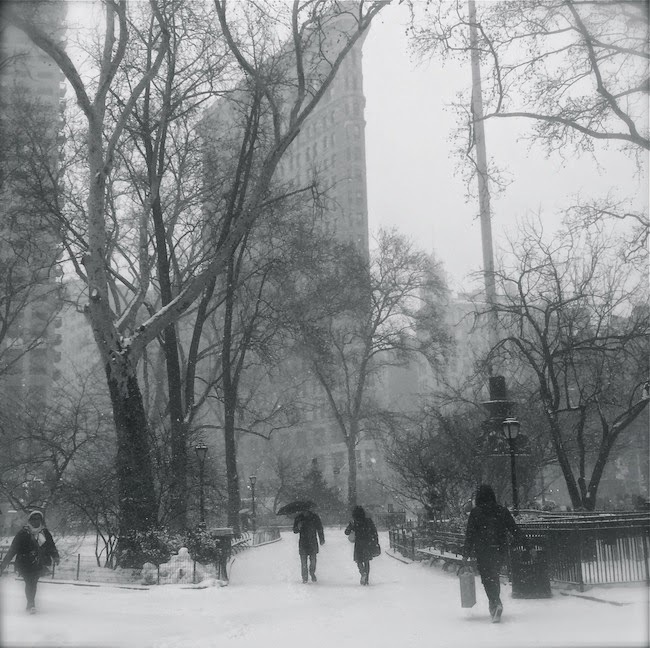 Walking through the park and fresh snow was so PRETTY and brought back so many memories. I remember hating this weather when I lived in the city. It was mentally challenging. But since I don't have to deal with this city everyday anymore it's a TREAT to walk dog, and kids, with snow flying in our face. The kids were bundled up and had no complaints. Not sure if Eddy liked it though. But now we know what he would look like if he was white! HA. EXHILARATING day. Did more then I expected, because as you can see the snow wasn't that treacherous when we were out and about. But after sun down yesterday it started to get BAD. Glad that we were able to be active for most of the day. Sure beats staying at home in the burbs, worrying constantly, and having to shovel our way out of an igloo! During our lock up we've been glued to the TV having a weather channel marathon. What NY-er hasn't been following the news to a T? We're estimated to be hit by about 2 feet of snow by the end of today. WOW. They say the blizzard should be out of here tonight, and if so then it's time we head back home to reality. The after math in the burbs is what I worry about most. How much damage, down trees, power lines (since they're all above ground in our town), and the big question…HAVE WE LOST POWER? If so then the adventures with Mama continue! Stay tuned.